In honor of Native American Heritage Month, I decided to read one of the unreads on myshelf that was written by a Native American author. My hand almost automatically reached for The Death of Jim Loney by James Welch. There were no profound reasons behind the buy. In fact, I can admit that it was a hmm-interesting-title purchase (this occurs often, though not as often as the oooh-pretty-cover! purchase). I figured if you lay it out like that in the title – Psst. Hey! You know this guy dies right? – then the writing must be spectacular or the plotting inventive, some kind of fireworks. Glad to say, I wasn’t wrong, though rather than fireworks, it was more like a close-up frame-by-frame of a single flame and the small hole it makes in the darkness around it. Welch zooms in close and gets right into Jim Loney’s crazy head and the minds of all the other characters too, often without intruding their thoughts, just seeping out their whole character in a few lines of dialogue (I found this to be the case especially with the father). With these finely sketched characters, Welch constructs a portrait of Loney’s whole life, of the lives of the people who knew him and abandoned him and loved him. We come away feeling like we’ve been to Harlem, Montana, and know all the regulars at the bar. And we come away too feeling that despite everyone being around and knowing all about everyone else, each of these characters is in fact an island, isolated each in his own way. Of course, we get the closest look at Jim Loney. We follow along as he pieces together his murky past, without any consequent clarity. He seems only to recede further and further into himself the more he finds out, until we question whether he was ever really alive at all. It’s hard to enthusiastically recommend this book, because it’s so freaking miserably sad. I mean, it’s not for your Monday lunch hour. But it is worth the read. For it’s powerful depiction of a way of life, a whole town of people that are so intimately portrayed and distinct that you’ll remember them without a chart of genealogy at the front of the book (I’m lookin’ at you Marquez). It’s good. If you’re a budding writer, take a tip from Welch on how to write full-bodied people and living places. This book is a work of art. I would have it hung on the walls in the Louvre. Welch wrote during what has been coined the Native American Renaissance literary movement. 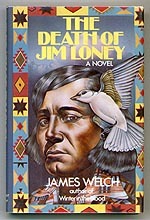 In his lifetime, he wrote 5 novels The Death of Jim Loney being his second in 1979, his third novel Fools Crow receiving national accolades. He also wrote several volumes of poetry and a non-fiction account (and later documentary) of the battle of Little Bighorn. Basically, he rocked hard.